Home Baker's Challenge started by Priya is a monthly baking group where each month we learn to bake new dishes. Thanks to the group for pushing me to start baking and I now love baking more than the regular cooking. 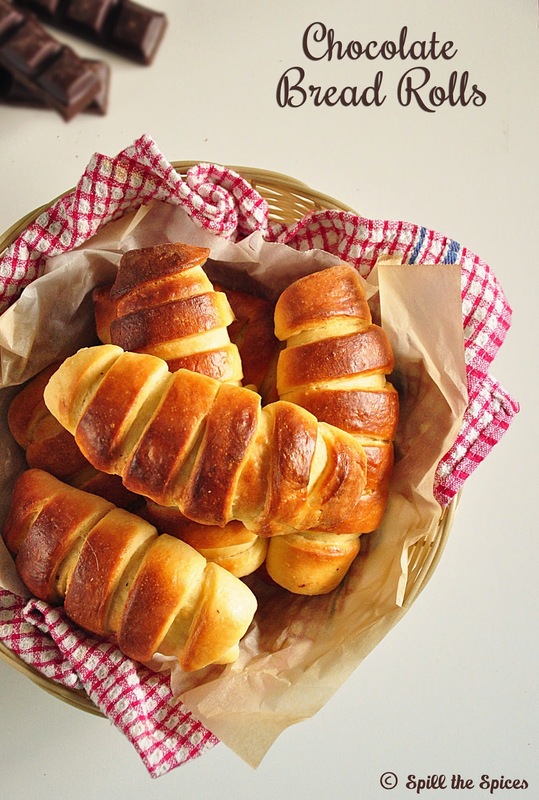 This month's host Gayathri of Gayathri's Cookspot chose bread rolls as the theme and she selected some wonderful sweet and savory bread roll recipes. All the recipes were so tempting that I was really confused which one to chose. Finally I decided to make this chocolate stuffed sweet bread rolls. Other recipes in the challenge are on my to-do list! These bread rolls are really easy to make and I would definitely make them again, perhaps with a savory filling. Off to the recipe now! 1. In a large mixing bowl, add bread flour, cake flour, dry yeast, sugar and salt. Mix well. 2. Then add egg, milk, water and form into a dough. Add the butter and knead into the dough until the dough is non sticky. 3. Cover with cling wrap and let the dough rest in a warm place to rise for about 1 hour. 4. After the dough has proved, place in on floured surface and deflate the dough. Divide the dough into 10 equal pieces. 5. Roll each piece into an oval shape on a floured surface with a rolling pin. Place the chocolate on the edge of one side. 6. Cut the other side into strips. Gently fold over and tuck the strips underneath. Place the rolls on a baking tray lined with parchment paper. 7. Cover the rolls loosely with cling wrap and let them rest in a warm place for the second fermentation, about 45 minutes to 1 hour. 8. Preheat oven to 175 C | 350 F. Bake the rolls for 12-16 minutes or until golden brown. Before serving, warm the rolls in the microwave for 10 seconds. You can also fill with chocolate chips or nutella. Those look absolutely gorgeous, and so professional looking. Kids would love these .. too good. 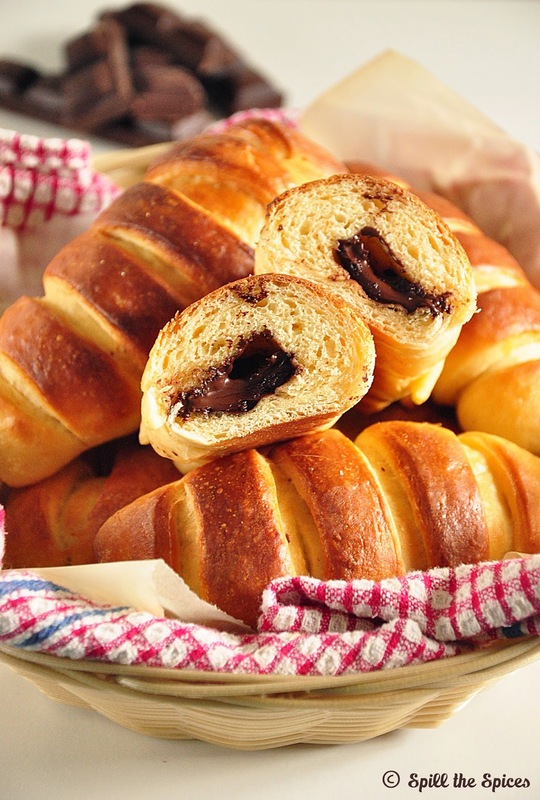 Yummy delicious chocolate bread rolls made to perfection. kid friendly rolls. looks delicious..
Wow, what a shiny covering. Lovely ! They look so perfect, very tempting clicks..
Chocolate rolls looks perfect ...... Delicious too!! Awesome pics. Perfectly made yummy rolls, love the shine on them. 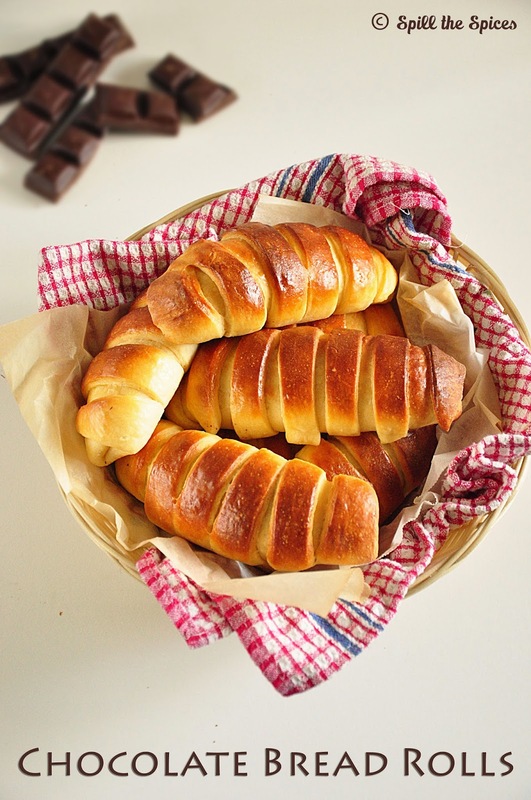 Beautiful pictures, can't take eyes off these delicious rolls, they are soooo tempting!!! Wow perfectly made bread rolls.. love all the pics specially the 2 nd one super. Perfectly made choco rolls................looks awesome. Those bread rolls are torturing me, looks fabulous SOna. Wow ! Truly drool worthy ... Nice pics too..